With great specials on ounces, top quality cannabis, a variety of edibles and concentrates, a welcoming environment and friendly staff, High Level Health dispensary in Denver has quickly earned a name for itself in the Mile High City. 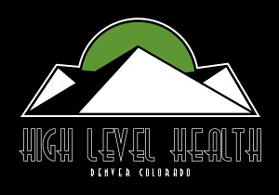 High Level Health has two locations in convenient locations in Downtown Denver. Checkout the map below to find the High Level Health MMJ dispensary nearest to you. View High Level Health Denver Dispensary Locations in a larger map High Level Health on Lincoln Street 970 Lincoln St.
Prices of marijuana in Colorado are considerably lower than in other parts of the U.S. and prices of marijuana at High Level Health are among the lowest you'll find in the state. 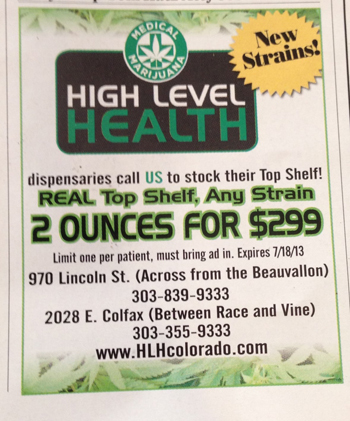 As you can see in the photo on the left, High Level Health dispensaries normally runs an ad in the local Westword magazine promoting a special for 2 ounces of any top shelf strain for $299. With most MMJ dispensaries in Denver charging over $300 per ounce for top shelf strains, medical marijuana patients can save a lot of money by buying in bulk from High Level Health. There's no shortage of top-shelf cannabis strains on the dispensary menu at High Level Health. Here's a sample of the Denver dispensary's menu.